You can read all about the Garden of the Gods HERE. Amazing as it might seem, this is the first “proper” post about it on this blog. And, it’s only a small portion of all the photographs I have, dealing only with my first visit there. This post, you see, is about the first time I visited the place, back in 2004. It was October of 2004, and we were on a grand loop drive . . . we went to Illinois to pick up Melisa’s dad, then drove to Colorado Springs, then to Bozeman, Montana, then back to Chicago, and home to Michigan. This is the first photo I took in Colorado, coming in on Highway 24. That is Pikes Peak; my first view of it. Much like people heading out West on wagon trains, I stopped and gaped. They did not have the power lines poles to contend with, but then neither did they have paved roads. I made the best of it; I used the poles to lead the viewer’s eye to The Peak. Then I did it in selenium . . .
We did not know where we were going . . . we just rode Hwy. 24 all the way in . . . and ended up at Garden of the Gods. It was a tad fortuitous the sky was overcast to the Northwest, and indeed, slightly overcast above us. It made to a nice light that I think complemented the red rocks very well. Many more visits would be made after we moved here, but these are still some of the best photos I have of the place, strictly because of the light, and the contrast to the distant dark sky. After spending some time among the rocks, we headed to the Visitor Center. That’s the view from the balcony of the Visitor Center. Here are a few more views. Now, I know the coloring looks odd . . . I’ve done nothing beyond my typical adjustments, so the photos are very close to “as shot”. There are paved roads through the park, and we drove around a bit. We saw trees grow from rock . . .
We saw what must be part of every place that has red rocks . . . a balanced rock. OK, so it does not look like a balanced rock . . . how about this? 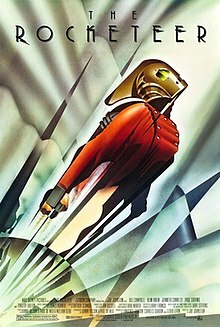 I always thought the profile of the rock looked a bit like that of the Rocketeer . . .
That poster is copied from the Wikipedia entry for the movie. If I understand the copyright as explained in Wikipedia, photos posted on there can be used for non-commercial use. If not, I don’t have to worry too much . . . it’s not like I’m widely read. That’s not the only strange image I get from looking at rocks. This next photo has a petrified alien being sitting on a slab of rock . . . or maybe squatting . . . waiting to be awakened. Gosh . . . I hope he was not going to the bathroom! Imagine being petrified in that pose . . . for eons. Anyway, I’m going to wind this down . . . Back then I was still in my stingy mode when I shot photos, so I don’t have many from the visit. That changed as I became more comfortable with the digital medium, and memory started to get really cheap. I will leave you with one last shot . . . I like the texture of both the rocks and the knurled trees scratching a living from between the barren rocks. Garden of the Gods is on my way home, and I occasionally cut through it if condition hint at the chance for good photos. That has not happened for a few years now, but perhaps this summer . . . Anyway, there are a few more photos in the SmugMug Gallery (HERE) for them who might be interested. I did not switch on the “Original” setting because these are fairly rough photos, and it’s not really about the details . . . just enjoy the pictures. If you enjoyed this moment, found it amusing, saw some decent photos, or learned something, feel free to share it. However, if you hated the whole thing, were bored beyond belief, and consider it a waste of time . . . why, then, it’s the perfect thing to forward to people you do not like! It will serve them right! Astute persons might have noticed these doodles, and correctly surmised they hold some significance for me, and perhaps for humanity at large. If said astute person is curious about them, click on it for an explanation of their origin. WordPress is still screwing around with trying to be a class operation. As such, while they busily work to add features and themes I will never use, they are remiss in fixing problems like disappearing links. So, if you click on the doodle, and nothing happens, this is the link it’s supposed to go to: https://disperser.wordpress.com/2011/12/26/palm-vx-and-i/. Note . . . there is no guarantee WordPress will keep this as a link, but at least you can copy it and paste it on a browser’s address field. Please, if you are considering bestowing me some recognition beyond commenting below, refrain from doing so. I will decline nominations whereby one blogger bestows an award onto another blogger, or group of bloggers. I appreciate the intent behind it, but I would much prefer a comment thanking me for turning you away from a life of crime, religion, or making you a better person in some other way. That would actually mean something to me. This entry was posted in Colorado, Garden of the Gods, Photography Stuff, Travel Stuff and tagged Colorado scenery, Garden of the Gods, Photographs, Photography, photography stuff, Red Rocks, scenery, travel. Bookmark the permalink. Thanks for sharing the photos … lots of good ones … I visited the same place back in 2008 and didn’t take a single photo (except the memories in my head) … nice to have a chance to see it again. Especially love the contrasts, and the ones featuring the trees, too. Nice group. Thanks . . . it made me want to take another visit there. We’ve not gone in the past two years. It always seems crowded, and my tolerance for crowds has slipped a number of notches. Glad it triggered your memories. We don’t have landscapes like this in Britain – fascinating to see the balanced rock. Would be fun to sit under that thing. I like the way the gnarly tree in the last photo has taken on some of the colouring of the rocks. I have a few photos of my father-in-law “holding up the rock”; a popular pose for many visitors. Reblogged this on North American Educational Explorers. amazing nature ^ ^ the first and the second photos make me feel so peaceful , take a walk and get lost in those endless golden fields must be so great ! > – < Oh my, how did they dare to sit under those giant rocks…just breathless ! Those fields are, unfortunately, on private lands. I suppose one could hop the fence and meander up and down the hills, but that would be trespassing. As for sitting under those rocks . . . obviously they are tired of this life, and yearn to speed o their journey’s end. Ah, abt those “rocks-ninjas” ,I think they may just have some breaks , like we may fell tired of this life – for many times – but everything will be ok, no-one can be happy or blue 4ever, all feelings and emotions are just temporary. Hope that they will have more beautiful journeys after those breaks under giant rocks ! ^ _ ^ as long as they want to, they will – I believe! Hmmm . . . as much as I like the enthusiasm and optimism of youth, the phrase “as long as they want to” has always grated on me. It smacks of “The Secret” and other dangerous thinking, and I’ve seen plenty of evidence where that kind of thinking can negatively affect one’s life. Life does not “have to work out” and certainly it does not bend to our belief. I can point to recent tragedies here as perfect examples . . . an 8 years old boy who is killed when a bomb exploded – it did not matter what his hopes, attitude, or desires were. People who get hurt of killed because some drunk driver did not believe anything like getting into an accident and killing someone was a part of his life – until it happened. Floods, tornadoes, disease . . . it knows nothing of hopes, aspirations, or “believing”. Note that I am not saying one should be doom and gloom; I’m generally a happy person. But I am also aware it can all change with a call from a doctor, a momentary loss of concentration or awareness, or through the action of some other agent outside my control. That belief, that nothing bad will happen to you because you don’t want it to, or that things will work out because you really want them to . . . it’s the building blocks of tragedies. Ppl may die easily and unpredictably, yah , like those “Floods, tornadoes, disease, bomd…” but that’s kind of destiny’s call , we have no choice, it has already been over before we can even know what’s happening. But if we are still alive, as long as our hearts can keep on beating , we have choices, even though we may not change the fate , what will be will be, at least we can choose a happy way to go , a bright side to believe,making memories and things to cherish instead of giving up and waiting for the end of life to come! Great pictures of some very dramatic landscape! Thanks Sandy. I should get back down there this year. Although I see it from the road I drive, it’s much different walking among the red structures themselves. I love THE Stones shoot,great THE nature too!! Red rocks are always very striking . . . and there are a lot of them here, and not just at this park. You won’t catch me sitting under those rocks. It’s only a matter of a few thousand years before they shift.and I don’t plan to be there when it happens. Outstanding photos, though. Almost all of the ones I have seen, including this one, has some shoring at the contact points (concrete). These rocks are very porous, so I imagine they would not last a few thousand years . . . but I could be wrong. I would love to come back this way a couple of thousand years from now to see. I enjoyed revisiting the Garden and it’s colorful rocks, even if only via this post. One day I’ll get a chance to do it in person again. I will probably be posting more from my extensive collection. If I ever get the time. I love the second shot..don’t mind those power-lines a bit, either. As you said, they take us into the image, drawing us nearer to the peak. Prairies and mountains…wonderful. Very nice, Emilio. Thank you Scott; I still love seeing that mountain, sticking up all on its own. You’re welcome…. I’m sure you do love seeing the mountain there, Emilio. It’s something that I’ve come to cherish, myself…. If you’re familiar with the view of the mountains from the southwest side of the USAF Academy, I used to have a great view of Blodgett Peak from my back yard in the housing area…used to dream of hiking up there…and finally did one day. Made it up there with a neighbor and our dogs. Sat on the peak and had our lunch…and looked at the pilots, eye to eye, as the gliders flew nearby…. It was a rush to be up there. I grew up in Northern Italy, and could see mountain in the horizon. When we came to the US, we moved to Illinois . . .
. . . yes, I love seeing mountains. Hmm…yes, I understand…. Living in Phoenix for all those years with dirt-clod type mountains on all sides…I prefer the real mountains of the Rockies, too….. I can really obtain useful facts regarding my study and knowledge. Well, I am glad to contribute to your study of rocks . . . what is it called? Oh yeah; rockology. I would like hearing about your knowledge of rockology, had I the time, and interest, but as it happens, I am currently trying to get a degree in spamology, and your post is much appreciated for adding to my study and knowledge. I would want the photographer to be really quick if I was sitting under that balancing rock! That’s been there for a while . . . plus it’s reinforced with concrete at the base. Visitors split into two groups . . . those who cannot be talked into sitting under it, and those who wait in line for the opportunity to do so.
. . . I was just the photographer, hence not a participant in the activity . . .